When the vision vanished after a mysterious and intimate conversation it left Francis aglow with seraphic love in his soul. Externally, however, it left marks on his body like those of the Crucified as if the impression of a seal had been left on heated wax. The figures of the nails appeared immediately on his hands and feet. The heads of the nails were inside his hands but on top of this feet with their points extending through to the opposite side. His right side too showed a blood-red wound as if it had been pierced by a lance, and blood flowed frequently from it. Because of this new and astounding miracle unheard of in times past, Francis came down from the mountain a new man adorned with the sacred stigmata, bearing in his body the image of the Crucified not made by a craftsman in wood or stone, but fashioned in his members by the hand of the living God. Today I saw the Crucified Lord Jesus. Precious pearls and diamonds were pouring forth from the wound in His Heart. I saw how a multitude of souls was gathering these gifts, but there was one soul who was closest to His Heart and she, knowing the greatness of these gifts, was gathering them with liberality, not only for herself, but for others as well. The Savior said to me,Behold, the treasures of grace that flow down upon souls, but not all souls know how to take advantage of My generosity (Diary, 1687). This entry was posted in Saints & Angels and tagged Divine Mercy, Mt. Alverna, St. Bonaventure, St. Faustina, St. Francis of Assisi, stigmata by texasnuns. Bookmark the permalink. 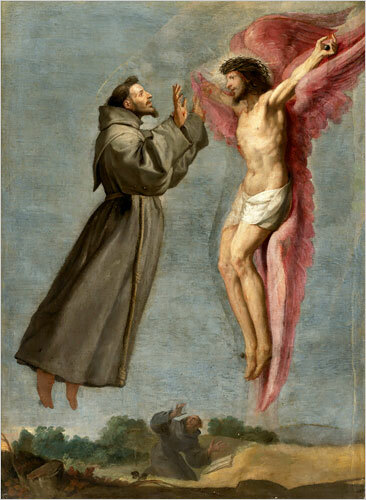 It is actually 790th Anniversary of St Francis of Assisi’s Stigmata. Ss Francis of Assisi and Robert Bellarmine pray for us.